Personalized Anniversary gift puzzles are great anniversary gift ideas for your wedding anniversary or any other anniversaries and special dates in your life. If you wish to celebrate an anniversary by choosing a personalized gift, make it memorable with your choice of personalized anniversary gift puzzles that mark the event's special meaning. Anniversary gift initials puzzles are personalized with the couple's initials that are joined by hearts and in the middle – the months/years of anniversary (e.g., letter P ♥ 10 ♥ and letter E). 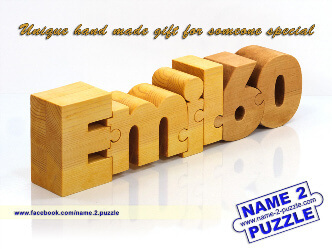 You could choose a personalized anniversary gift name puzzle with the name of the person and the years of anniversary (e.g., Emil 60). Surprise your Mom, Dad, Grandma, Grandpa, friends, colleagues or couples making them a personalized anniversary gift they will love forever. Each letter, initial or name is cut down precisely and perfectly joins onto the next letter/symbol. The names puzzles are unique and designed individually. 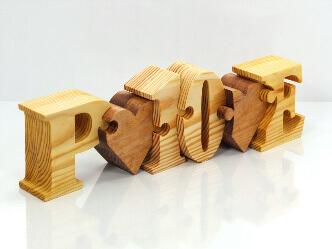 The puzzles are made of quality pine wood and handcrafted with a natural finish of olive oil. The puzzle can lay down flat or stand up for display on a shelf, desk or any horizontal surface. 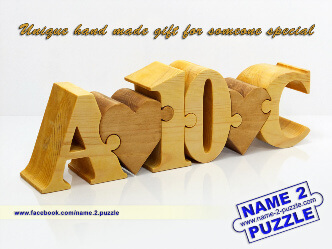 It is a one of a kind personalized anniversary gift puzzle that will freshen up a room décor. Everyone who looks at this will say “What a cool and fabulous work of art you have here!” This is a gift that will be treasured forever! NOTE: We do not have ready to buy anniversary gift puzzles. We make them only by order. Dimensions: 23 x 7 x 4 cm. Dimensions: 26 x 8 x 4 cm. Dimensions: 25 x 8 x 4 cm. Dimensions: 20 x 8 x 4 cm.